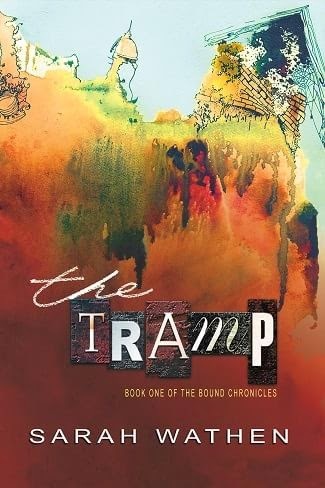 Today we are interviewing Sarah Wathen, author of the paranormal mystery novel The Tramp, book one of the Bound Chronicles. 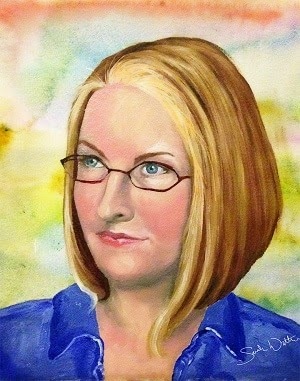 I’m an artist turned author. I’ve always loved to write, but I only started writing young adult fiction about two years ago. 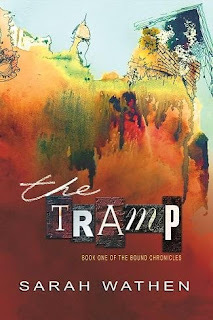 Now I can’t get enough of it—The Tramp is my first full length novel, and it’s part of a four-book epic paranormal mystery series. I’m already working on book two, The Glamour, and I’ve finished a serial offshoot novel due out in July, Catchpenny. I also write YA flash fiction thrillers, and boy are those addictive. Painting with words is even more fun than painting with oil! Describe the plot of The Tramp in a few sentences. Childhood friends, Candy and John, share a bond more unique than they understand. They’re in the midst of all the normal traumas of being sixteen and in high school, but there is something sinister lurking underneath the trivialities of their small town life. Jealousy, desire, and revenge is a vicious cycle in any love triangle, but Candy is about to find out that what ties her to John is anything but normal. And much more vicious. Readers who enjoy settling into an epic tale, full of history and interconnections, will love this series. I’ve been told that my characters are so real that they feel like friends, and that makes me so happy. By the end of the Bound Chronicles, readers won’t want to let them go. What drew you to the young adult paranormal mystery genre? When I started the first draft, I did a lot of research into the region where the story takes place. Shirley County is fictitious and I never specify where exactly it is, but it’s vaguely around the Smokey Mountains of Tennessee. I read about everything from the flora and fauna, to regional food, music and crafts, to the colonial settlers and the Native American tribes that were there first. The history was so rich that it seemed to me ghosts of the past MUST still circulate in modern times. I couldn’t write a new story without unearthing the past. And high school kids uncovering a mystery was simply natural—they’re the most fun to write about! Tell us a bit about the protagonist, Candy Vale. Candy is a tomboy who revels in going against the grain. She’s rebellious in a quiet way, though, and her awkwardness is part of her charm. She doesn’t realize she’s turned pretty in the past couple of years, even though the alluring new stranger, Sam Castle, has chosen her above all the girlie girls in their high school. She’s got a fiery temper and it gets her into trouble more often than not—especially when she blows up on the people who love her most. Candy uncovers a surprising family history. Without giving too much away, can you give us any hints about what she discovers? This was tough to do while writing The Tramp! I did want to give some clues, and one part of the mystery is solved in each of the four books. But as everything is connected, I don’t want to spill the beans. One thing I can tell you is that Candy has strange eyes, black eyes that Sam calls “fathomless.” They’re so weird because Candy is very fair and redheaded. She finds a painting—hundred of years old—of a Native American woman that Sam swears has the same eyes. This is the first clue that she starts to trace. That’s sort of a funny story. About the time I started The Tramp, I was reading Stephen King’s book, On Writing. Without consciously doing so, I followed his advice to (I’m paraphrasing here) start with a situation, then build a story to make that situation happen. I began The Tramp by inventing the climactic scene first, then I did all my research, built the town, and developed characters to make that scene possible. That method just worked for me, and even though I’m not a huge fan of King’s fiction (I do enjoy it, though), I found On Writing to be excellent help for a new author. The funny part is that I’ve had several reviewers compare my writing style to Stephen King and it was a complete shock to me. I take it as a compliment, but it was the last comparison that I expected! Do you think your background as a painter and illustrator has impacted the way you write stories? Definitely. Art is a big part of all my stories because I guess I see the world through an artist’s lens. It’s what I know and art helps me to translate my thoughts into words. Since I’m a visual artist, I think I tend to put a lot of imagery into my writing—sometimes too much. Early on, my alpha reader nixed entire pages of description where I got carried away. Editing is tough. The Tramp went through 8 rounds of edits and the book that I started with is nothing like the one that I published. I’m glad for it now, but that process was grueling to the extreme. What can readers expect from the next book in The Bound Chronicles series? The second book starts right where The Tramp leaves off, the very same day. There are plenty of unanswered questions at the end of the first book, but readers can expect questions (some, not all) to be answered pretty quickly upon starting The Glamour. Is there anything else you'd like potential readers to know about The Tramp? Thank you so much for hosting me, Maxine. I’ve really enjoyed this interview! The evergreen forest closed in around John and Candy. They stepped over loose earth and around algae-covered boulders, still slippery from a recent rain. John spotted a patch of bright orange mushrooms sprouting around the base of an enormous pine tree. “Which alien planet sent those as spies?” he wondered aloud. Delighted, Candy decided that they must find clues to lead them to the mushroom spaceship. No rubies were discovered that day, but John did find a bright red ladybug that he swore bit his nose, despite Candy’s protestations that “fairies” don’t bite. Candy found blue flowers with yellow sunny centers and John helped her lace them into her braids. She threaded her fingers with his when it was time to head back. “Candy,” said a deep, quiet voice. John jumped and Candy yelped. “Candace, you need to come with me. Right now.” He was gruff and stony-eyed. “Jeez. Come on, John,” said Candy, tugging her new best friend’s hand. “We’re not going to Grandma Catherine’s. Your mom wants me to bring you home.” Her uncle clenched his jaw and gestured towards the truck again. The pick-up’s engine ticked out tense seconds. John strained his vision and could just see the limp figure of another kid asleep on the bench inside. “Yes. Everything’s fine, sweetheart,” Uncle Brian said, his tone softening and his smile returning. The smile looked forced to John. “Okay. Well…bye.” Candy dove in for a hug. She squeezed his waist, leaned back and shrugged, “You just follow the trail around either way. It leads you right back to your grandma’s house. Or mine. It just circles the woods. Sorry.” She turned to walk with her uncle, without taking his hand. John watched her walk away, her cut-off jean shorts still damp and muddy in the rump, and her coppery braids twisting down her back, trailing blue flowers with every step. She got into the cab next to her “sleeping” cousin—pinned between him and Uncle Brian—and waved from behind a filthy window. Her uncle slammed his door, avoiding John’s gaze. Then, the ratty truck spun its wheels hard, and they peeled away off the grassy shoulder, tires squealing on the asphalt. John gasped and trotted over to the road to see them racing away in a cloud of dust. He sprinted home, his feet pounding the packed earth and his lungs choking on their exit.